Have you ever gotten off a plane, looked down at your swollen legs — and become alarmed at their size? Rest assured. It’s usually not a serious problem. Swollen ankles, feet and legs are common among travelers—especially older ones. 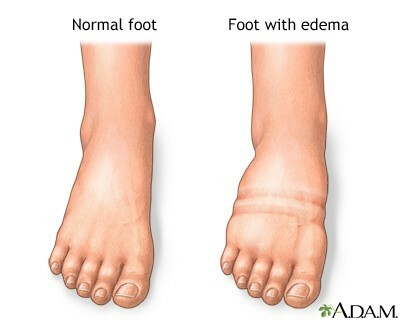 With aging, many people experience edema (excess fluid buildup in the tissues) after long flights. Although temporary, swollen legs can be more than unattractive. Depending on the extent of the swelling, you may experience discomfort from the stretching of your skin, or have a tough time getting your shoes back on (if you’ve taken them off during a flight). What causes leg swelling when you’re flying? The amount of legroom on flights seems to constantly be shrinking. And depending on the placement of your seat and the pattern of turbulence, it can be difficult to get up and stretch, especially on lights-out overnight flights across the ocean. Being seated in one fixed position in a cramped space for a long period of time causes fluid to leave the blood and move into surrounding tissues. Is swelling more prevalent with age? Aging makes many things more complicated, including leg swelling. Older people are prone to experience more significant swelling and tightness after long flights than younger people for a variety of age-related reasons. For example, their veins don’t circulate blood as well as they used to, and they are more likely to be taking certain prescribed medications (e.g. blood pressure-lowering medications like calcium channel blockers). What can you do to prevent swelling? Get up, move, and walk up and down the aisle several times during the flight (your bladder will thank you, too). If your legs swell, what can you do afterward? If your legs, ankles or feet are swollen after getting off the plane, it’s wise to elevate them (above your heart) to lessen the swelling. Swelling that doesn’t dissipate after several hours of activity. Mayo Clinic: What causes leg and foot swelling during travel? Excellent article! This just became an issue with me. Now I swear by compression socks and re-hydration products in addition to lots of water. I’m curious…what kind of re-hydration products do you use? Maintaining a healthy body weight is probably the one piece of advice that may be difficult to achieve on the fly—so to speak. 😉 I’ve definitely noticed that it’s harder to slip my shoes back on after a flight. Maintaining a healthy body weight is most important. My feet and ankles used to swell on long road trips, so I began stopping every hour or so to walk around to prevent this. Now I can do a 6 hour drive with one stop and my ankles don’t swell at all. My doctor told me there’s usually no worry if both of your ankles swell. The time to be concerned is if only one side is swollen because it could be a sign of something else more serious like a blood clot. Good advice from your doc! Congratulations on your weight loss. You’re more fit to travel! People make the mistake of thinking that cruises are sedentary but most travelers do far much more walking and standing than they usually do. Your timing is epic. This has never happened to me before except just a few days ago. We took a red eye from Kauai (used miles, you take what you can) I noticed that both of my feet were swollen in the car on the way home. Kind of freaked me out! Since is was an overnight flight, I only got up once. I also crossed my legs a great deal. I won’t let this happen again. Great article Irene! I’m a huge believer in compression socks and wear them on all flights. I even use them for trade-shows or all day walking they make a big difference. You are one of the few. Many people dread putting them on. So far — knock on wood — I’ve been lucky and never had swollen ankles. I always drink a lot of water on flights, and, of course, that means I make multiple trips to the toilet, which lets me stretch a bit. And in most planes I’m too tall to be able to cross my legs, so I don’t do that either. Thanks for the tips, though. I suppose it’s just a matter of time till this starts happening to me too on long flights! I think genetics makes some people more prone than others. You may be among one of the lucky ones! What a great article people often avoid writing about these things as they think they are not interesting. Will bookmark for our next flight great tips to help stop the cursed swollen ankles. My sister-in-law always gets swollen ankles on even a relatively short flight (3-1/2 hours) but not on much longer road trips of several hundred kilometres. She does everything possible – excercises; walking, elevation of legs, etc. – but nothing works. She said that as soon as she comes back home the swelling goes down. I was a bit dubious, until this happened to me also. Long car trips cause a little edema, but a 33-4 hour flight has my ankles and feet hugely swollen, and staying like that for days and days. When I came home, all of the swelling had gone by the next morning. So, I’m not sure that it has a great deal to do with inactivity. This is more likely to occur in a plane than a car because there is less space and opportunity to move around. It’s important to wiggle your toes, move your feet, and stand up and walk around, whenever possible. Most airlines provide beverage service with water. You can also purchase a large bottle of water after you pass through security.